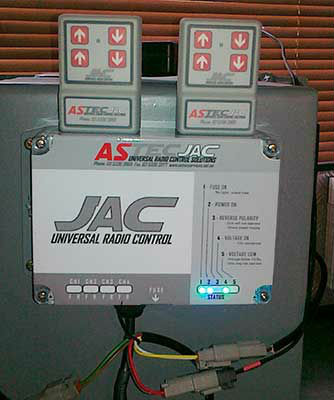 JAC is a remote radio control system that can help with may daily tasks. It can be used to open and close gates, doors, latches and tailgates. It can operate throttles, clutches, generators, it can stop and start pumps just to name a few. JAC can be used for many applications and is only limited by your imagination. JAC allows you to operate equipment from a safe working distance and removes the need to be close to dangerous machinery letting you keep your mind on the task and yet being able to control the process single handed. All this is done with a simple press of a button form up to 300m away. JAC allows the operator to control machinery without exposing themselves to potentially hazardous situations. With the ever increasing emphasis on work place safety, JAC is the remote hands in the hazardous area. Basic kit includes 1 JAC base unit and 2 remotes, 1.5m power supply cable and Deutsch plugs fitted to suit field connections.